*NSYNC pose next to their star on the Hollywood Walk Of Fame. Photo credit *NSYNC Instagram. If all singing all dancing boybands were your thing in the 90s – and for a sizeable portion of today’s adults they were – then *NSYNC were certainly on your radar. Arguably the biggest of them all (we accept dispute from fans of Backstreet Boys, Take That, Boyzone and Westlife) *NSYNC were formed in Orlando, Florida way back in 1995. They have had huge hits with songs like ‘Bye Bye Bye’, ‘This I Promise You’, and ‘It’s Gonna Be Me’, the song which has possibly become the best meme ever because of how they pronounce “me” as “May”. Such was the excitement and anticipation of the event that there were fans lining up from as early as midnight ahead of the 11.30am ceremony. 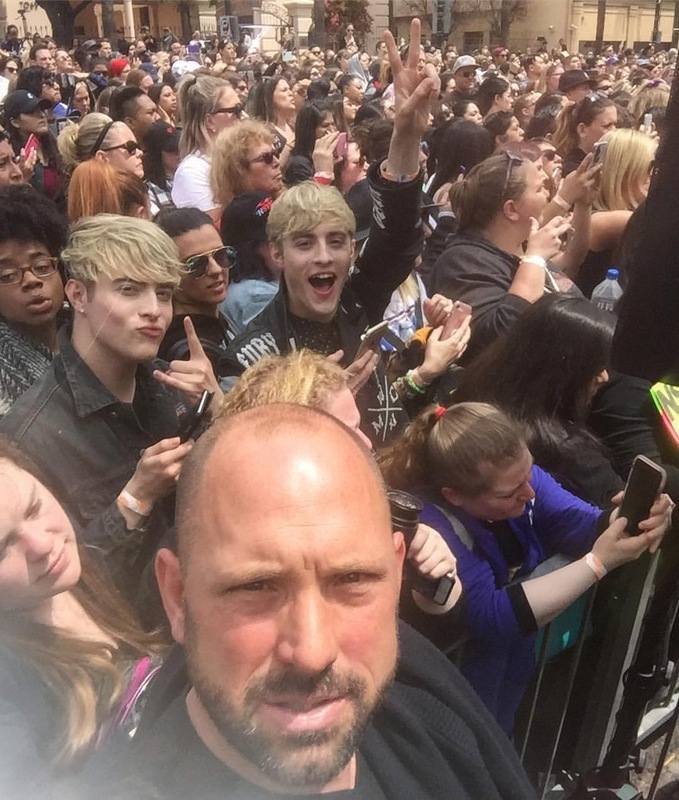 Some had travelled great distances to come to the show, many also combined their trip with a visit to *NSYNC’s “Dirty Pop-Up” merch shop on Hollywood & Highland, as well as Justin Timberlake’s shows on 28 and 29 April at the Los Angeles Forum. Los Angeles-based photographer Michael T Rozman captured this photo of the crowd. Among them were John and Edward Grimes (aka Jedward), long term *NSYNC fans, who are currently in LA recording music. If you would like to visit *NSYNC’s star on the Hollywood Walk Of Fame, it’s situated on the pavement outside Live Nation/Ticketmaster, 7060 Hollywood Boulevard, Los Angeles. The *NSYNC Dirty Pop-Up Shop is at Suite 200A, 6801 Hollywood Boulevard, at the Hollywood & Highland Center. It’ll be open until 5 May, and features a limited inventory of official merchandise, as well as fun opportunities to immerse yourself in items associated with the band. There’s authentic props, wardrobe items, artwork, and photography on display. Admission is free! For more information about *NSYNC (including about their pop-up shop) visit their official website.